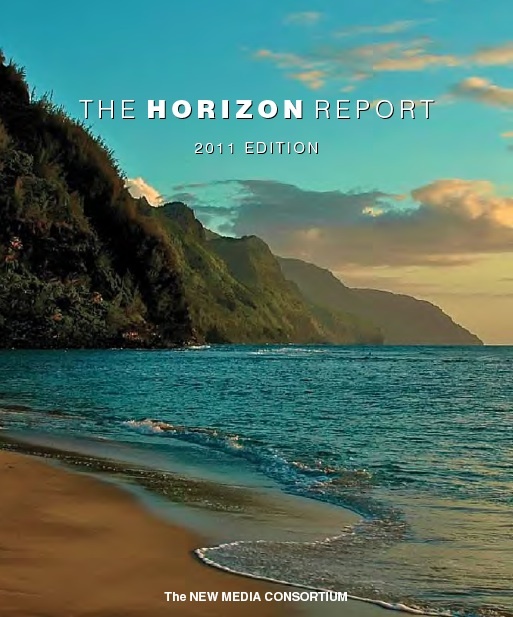 To keep track of the constantly evolving educational technology space I monitor trends such as those put forward by – New Media Horizons Reports and Tony Bates e-learning outlook for 2011. I also go with my own gut instinct on what’s happening. One of the biggest general digital trends I’m seeing is around video. Cisco predicts 90% of Internet traffic will come from video by 2013 and in my view digital video is a high impact innovation. At certain points in time technology innovations make it possible for everyone to do something that was previously only done by a few. Video has gone from a high cost, big production, network and distributor controlled media to a mass market phenomenon that any one can do. Video is now being shot by everyone from children to grandparents. Video is being captured on cell phones, through web cams, downloaded, edited, streamed and uploaded directly to places like YouTube and blip.tv. Video has become ubiquitous. I have kids, OK well they are grown up adults now living out on their own, but one thing I’ve noticed is that neither of them have TV. Sure they watch movies but YouTube has become the TV replacement. And yet it’s different than TV. YouTube video content is produced as much by amateurs with video cameras and Internet connections as it is by corporate commercial industries. YouTube is a social space where comments, likes, and views are expressed on a global stage. A place where debates over politics, gender and religion take place. YouTube participants affect social change and address global strife in a democratized way not dominated by mainstream media. YouTube is not just a video distribution platform, it’s a form of participatory culture. How is video being used for education? What is educationally possible now that simply wasn’t possible before video became so ubiquitous? Are learning activities being designed that have students generating video assignments? How does contemporary video’s active and participatory nature manifest itself in education? Lots of questions but these provide a good starting point for investigating video’s role in education. In parallel with these questions I’ve been helping determine the feasibility of BCcampus providing a YouTube-like video shared service for BC’s public post-secondary system. Thought I’d share my discoveries on both fronts through this post. It will be fascinating to see if contemporary video practices, such as those embodied by YouTube, transition into and make an impact on education. There certainly is lots of interest. At a recent BCcampus hosted gathering to explore interest in a video shared service for BC’s public post secondary system there was a standing room only packed room and at least 10 of BC’s 25 universities and colleges are interested in seeing such a service put in place. One option for providing video capabilities to BC’s post secondary institutions is to simply acquire access from vendors like YouTube through Software as a service (Saas) cloud computing. However, these services are hosted in the US and the US Patriot Act contravenes BC’s Freedom of Information and Protection of Privacy Act. (For more on this topic see http://fippa.bccampus.ca.) As a result BCcampus has been exploring establishing a video shared service hosted in BC. In this context Kaltura, the open source video platform has emerged as the product of primary interest. 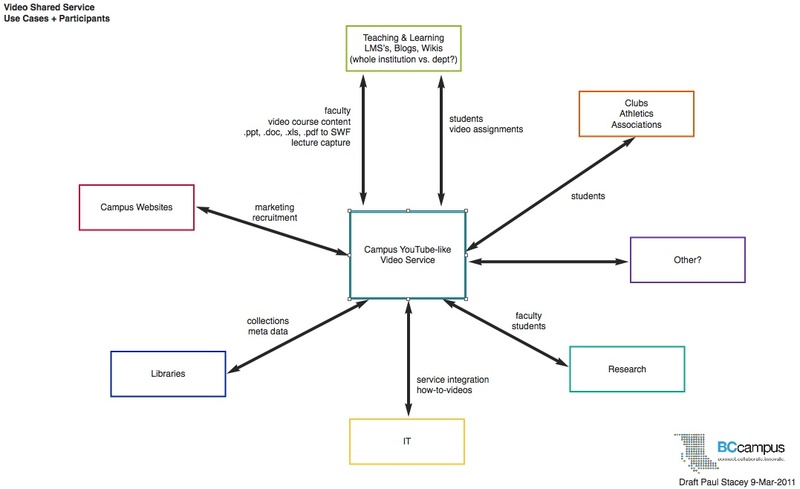 In defining a video shared service its important to determine the use cases BC universities and colleges are considering. I’ve created a diagram to identify some of the possibilities related to a YouTube like service (click on diagram to make it bigger). As you can see, the use cases are diverse. Faculty and students can create and embed videos as part of courses in Learning Management Systems, blogs, or wikis. Students could be creating videos associated with clubs, associations, athletics. Researchers could be using video to disseminate results. Information Technology departments could produce short how-to videos that demonstrate how to do various computing activities. Libraries could create and distribute video collections. Marketing departments might be interested in creating video to promote the school or show convocation or recruit students. It may be tempting to simply circle all these and say they are all of interest. On the one hand this is great as it indicates widespread possible use. On the other hand we’ll be asking people to indicate priority. Which of these are the most important, or perhaps even more to the point, which of these uses cases is ready to roll. Where might a pilot start? Congruent with considering use cases I’ve been looking far and wide at existing examples of video use in education. Education has for decades used film and videos as media elements for students to view in learning a particular topic. In the digital context these have been characterized as “rich media” elements. The combination of images, moving pictures, animations, music, and audio dialogue or narration create rich multisensory content that engages a range of personal learning styles. The Internet Archive has lots of old videos available for all of us to not only view, but also cut, copy and remix as footage with video we are creating. It’s fun to see faculty using video in new ways. Here’s the course trailer for EC&I 831: Social Media & Open Education, an open graduate course offered at the University of Regina by Alec Couros who seems particularly adept at remixing old to create new. Moving into more contemporary times I’m seeing a lot of education video produced as “lecture capture”. If you have an interest in the History of Art and from Roman times why not take in Yale Professor Diana E. E. Kleiner’s Roman Architecture lectures. 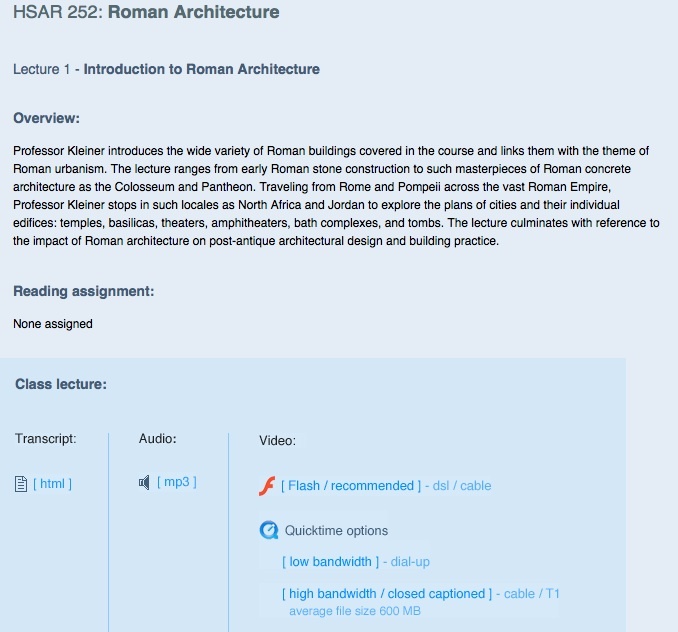 Yale uploaded the example above to YouTube but if you access the lectures from Yale’s site you’ll see the course is divided up into 22 separate class lecture sessions.These course lectures provide an introduction to the great buildings and engineering marvels of Rome and its empire, with an emphasis on urban planning and individual monuments and their decoration, including mural painting. The lectures are illustrated with over 1,500 images, many from Professor Kleiner’s personal collection. 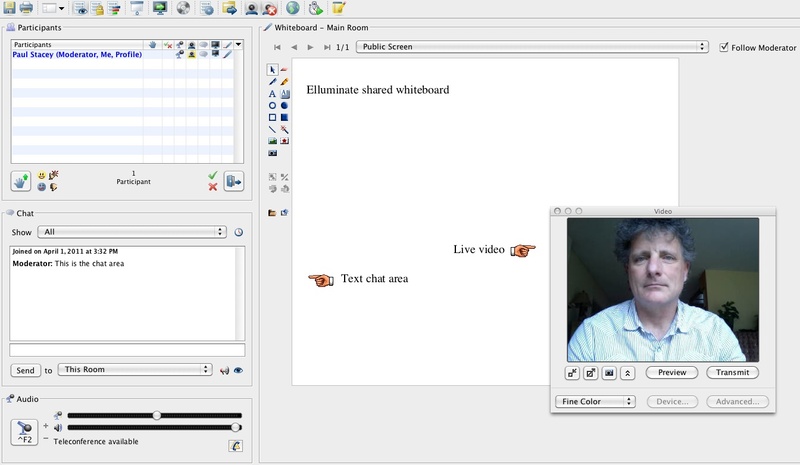 For each class lecture there is an html transcript, an audio mp3 file, and a choice of Flash or Quicktime based videos. There are literally thousands of these lecture recordings available from some of the foremost scholars in the world. How fantastic that they share their knowledge in this way! Many big name prestigious institutions use faculty lecture videos as a marketing and promotion activity. Video lecture recordings are also popular here in BC especially with students who missed a lecture on campus or are reviewing material in preparation for tests. However, lest you think I’m a lecture capture advocate let me fully disclose I’m only a moderate fan of lecture capture educational video. Lectures are an outdated, passive learning experience. In the 21st century we know that education and learning are social and active processes and we have a rich range of pedagogies available to use in learning this way. Despite this, lectures are still a primary mode of education provision as they enable massive throughput of students and require no organizational or cultural change. In the current education system efficiency and status quo trump effectiveness. Lecture capture can be absolutely awful if the scholar is not a dynamic or engaging presenter and if the recording is a full length traditional lecture. Some institutions are installing lecture capture systems and then proclaiming themselves to be meeting the learning needs of a 21st century student. This is utter nonsense. But still, having access to stellar scholars lecturing is a significant step in making education accessible to all. So how do you find the very best lectures? Who are the dynamic and engaging lecturers people like to watch? Some institutions such as the Yale example I gave above are publishing their videos on their own web site and on YouTube. With more than 13 million hours of video uploaded to YouTube during 2010 and 35 hours of video being uploaded every minute it can be hard to find what you are looking for there so let me provide a little help. YouTube categorizes video. From the main YouTube site you can search for videos in categories like Entertainment, News & Politics, Sports, and yes Education. Once you are in the Education category area you can choose YouTube EDU to access a further categorization. Within YouTube EDU videos have been categorized by academic domain. So for example you can choose to look at videos related to Business, Engineering, Fine Arts, Health, History, and Science among others. Once you pick an academic domain of interest videos in that category appear and you can further refine your search by specifying Most Viewed This Month or Most Viewed All Time. Most viewed all time brings the cream to the top. 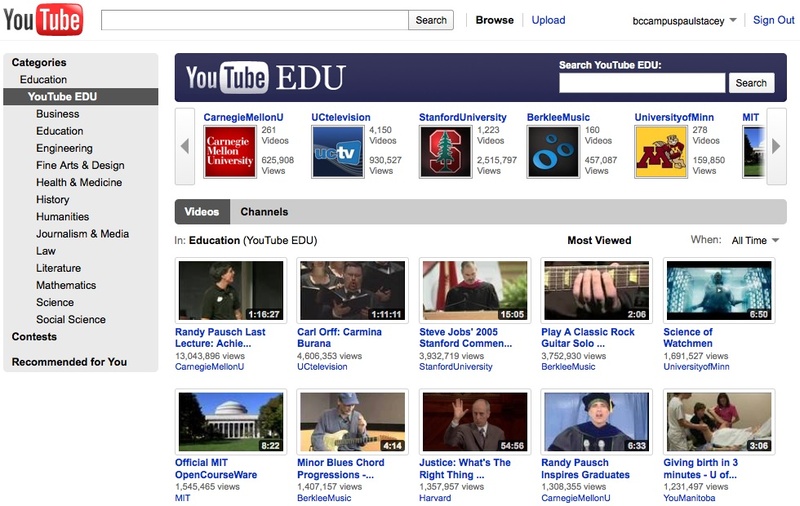 You also have an option to simply type what you are looking for into a Search YouTube EDU bar. YouTube EDU also has “channels”. Many universities, especially in the United States, have created their own YouTube channel. For example check out the UCBerkeley YouTube channel. Berkeley uses this channel to promote and market the university. You can make a donation to Berkeley, see their video lectures, and even watch videos of convocation. On the right side of the screen you can search UCBerkeley videos by Date Added, Most Viewed, or Top Rated. Clicking Most Viewed for example brings a video on Integrative Biology to the top which has had over 500,000 views. Clearly this video is popular. (By contrast the Yale Roman Architecture video I used above has had 23,515 views on YouTube). One of the benefits of having your own channel is that it is free of advertising. One more critique comment about lecture capture video before moving on. Effective use of video in education requires intentionality. With lecture capture video the video part is being treated as an afterthought add on. The primary focus is lecturing the classroom of students in attendance in front of the lecturer. The fact that other viewers will be watching the lecture after the fact has no affect on the lecturer. So lets turn to an example of educational video use that is very intentional. The most cited (and most viewed) exemplar of educational video these days is the Khan Academy. Originally started by Sal Khan a s a means of remotely tutoring cousins and family friends on math the Khan Academy now has over 2100 videos. The library of videos covers K-12 math, science topics such as biology, chemistry, and physics, and even areas like finance and history. Each video is a digestible chunk, approximately 10 minutes long, and especially purposed for viewing on the computer. Khan Academy videos are distinctive in a number of ways. The 10-20 minute chunks are especially purposed for viewing on the computer as opposed to being a longer video of a classroom lecture. The videos are not images of Sal Khan talking but rather Sal Khan using a pen-tablet mouse working out math formula or other concepts on a screen while talking to you. Sal Khan uses a conversational style rather than lecture style. He speaks directly to you as if sitting at your side and the concepts he presents are conveyed as they are understood by him not as written in a textbook or specified by a lesson plan. He obviously has a passion for it and it comes through. your vital statistics representing at-a-glance information about everything you’ve been learning. There’s even classroom profile data for teachers if they choose to use Khan videos with their class. All-in-all a very impressive site and set of resources. I’ve had people tell me that they struggled with math when they were a child but are now teaching themselves math using the Khan Academy videos as an adult. I highly recommend you watch the Khan Academy Exercise Software video. I’d be remiss if I didn’t mention How-to videos too. 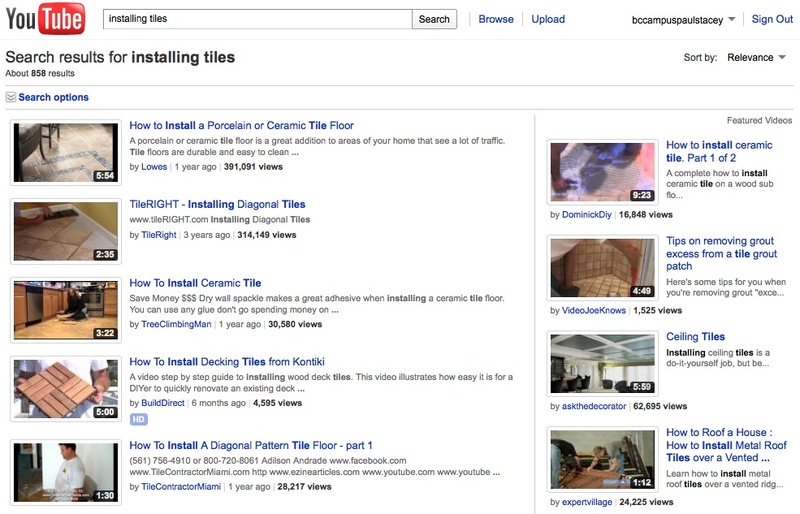 Want to learn how to tile a floor? Install a door? Build a chicken coop? You can find how-to videos on all of these and virtually anything you can think of at YouTube simply by typing in your search. 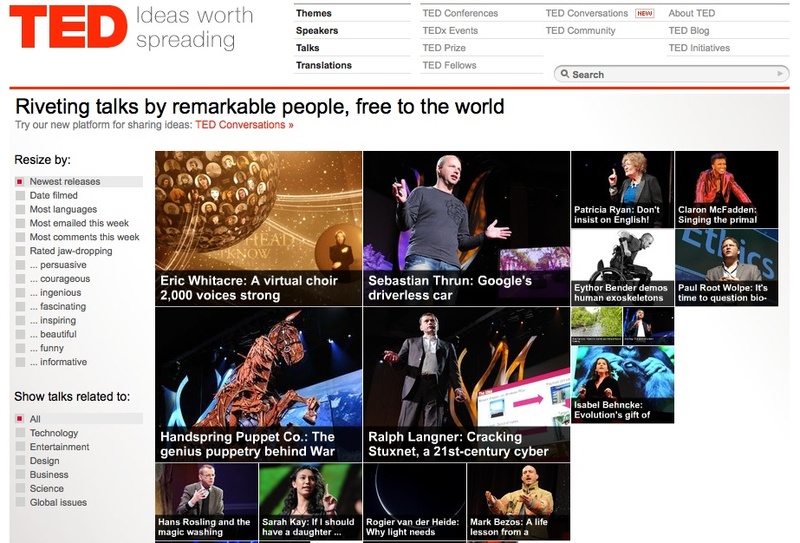 There are many who would assert that they’ve learned a lot watching TED: Ideas worth spreading videos. All this sounds great right? Yes, it is, but thinking about YouTube and video as simply a media distribution platform kind of like television falls way short of the potential. As Jean Burgess and Joshua Green note in their book “YouTube”. “Consumer co-creation is fundamental to YouTube’s value proposition as well as to its disruptive influence on established media business models.” YouTube is not just a content distribution platform it’s a social network, a community where participants are audiences, producers, editors, distributors, and critics. All YouTube participants have a voice partly expressed through Most Viewed, Most Favourited, Most Responded, and Most Discussed. Its active! Where are the video use case examples that complement the top-down use of video by institutions and teachers with bottom-up video from students as co-creators not just passive recipients? 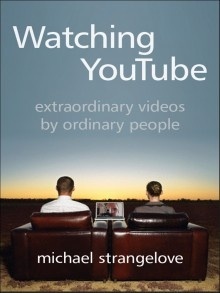 Well one great example comes from University of Ottawa professor Michael Strangelove who is author of the book “Watching YouTube – extraordinary videos by ordinary people” (a book I highly recommend you all read). Strangelove teaches a course on Popular Culture and Communication. As part of that course students create video based assignments. Here’s a page of student videos exploring how women are portrayed on TV and in film. Interestingly these student created works are now required viewing for subsequent students in that course. This is a great example of students as co-creators in education. Alec Couros is doing similar work as shown here with Student Work – Fall 2010. So what would it take to implement a YouTube-like video service for BC’s public post secondary system? Well as I mentioned at the beginning of this post we’re exploring the potential use of Kaltura. Here is another diagram I produced to support the planning around this (click on it to make it bigger). This diagram is intended to act as a decision making aid around which core software functions and the many options are important to BC’s public post secondary institutions. 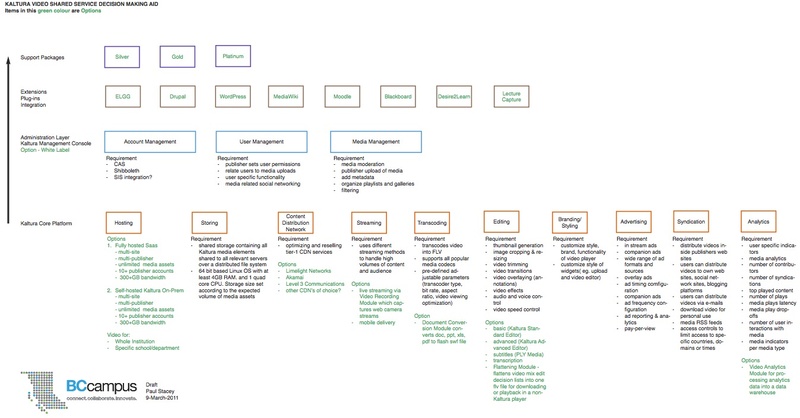 A diagram like this helps reveal the full range of functionality and the possibilities. It can aid requirements gathering simply by having people circle the elements that are important to them. You can see from this diagram that implementing your own YouTube hosted service has considerable complexity. At the core platform level depicted at the bottom of the diagram we can see that a YouTube like system involves hosting, storing, a content distribution network, streaming, transcoding, editing, branding/styling, advertising, syndication and analytics. Even at these core level there are options. Moving up to the top there are all kinds of options around integrating it with other applications such as Learning Management Systems, blogging platforms and social media applications. Video use in education goes beyond YouTube-like video too. 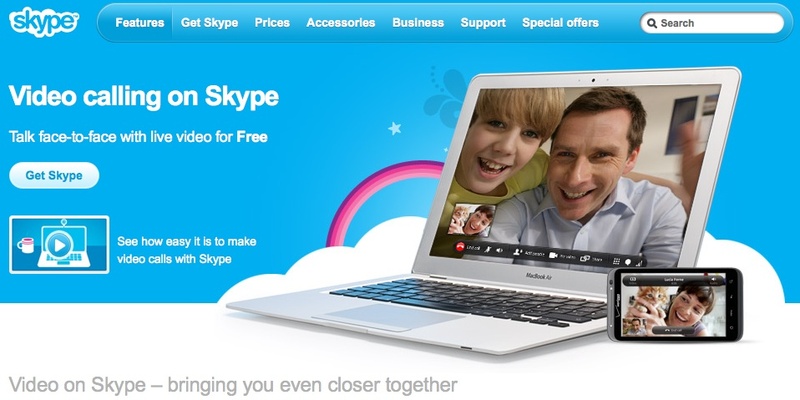 Video capabilities of applications like Skype eliminate the clunky, equipment and room-based expensive aspects of traditional video conferencing allowing you to have direct one-on-one voice and video interactions to a mobile device or a computer. Applicatons like Elluminate provide a means of bringing real time video images of people, places and activities to teaching and learning environments whether they be class-based or online. With an application like Elluminate you can actually record the audio, video, app sharing, chat and all other activities and interactions that take place within it and have it available as a video recording for playback after the fact. 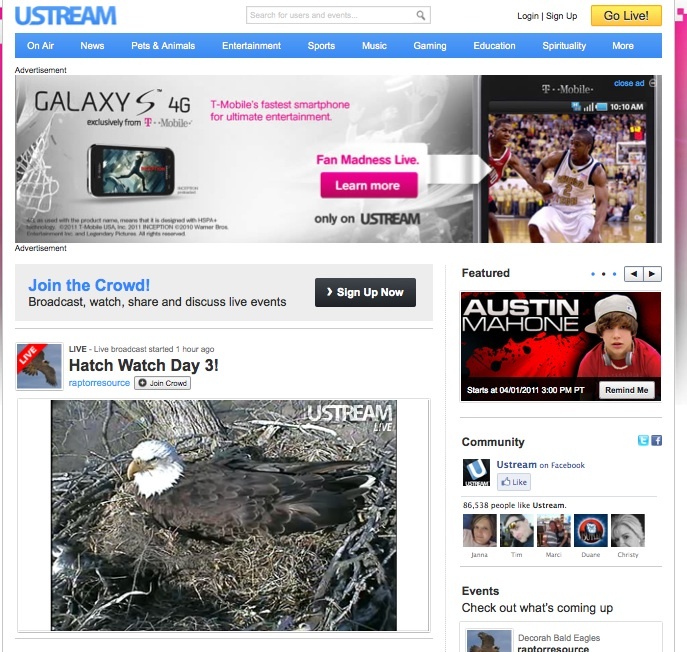 Video streaming of presenters at conferences or other educational events is also becoming increasingly common through services like UStream. Most of these examples point to a diversification of the means by which we can produce, edit and broadcast video. However, these initial use cases still treat video primarily as a media distribution method. The next big transition around use of video in education will be around the participatory, social networking and active cultural aspects of it. When these begin to emerge the real potency of video as a disruptive innovation in education will begin to be felt. I know that this is now a long post and if you’re a typical blog reader you’re ready to move on. But for those of you deeply interested in this topic, wanting to know more, I suggest you get yourself comfortable, turn off the TV, and instead watch this Michael Wesch video The Machine is (Changing) Us. I’m looking for examples of how video is a disruptive innovation in education. If you have an example let me know by replying to this post. To our BC public post secondary partners, we look forward to taking the next steps toward a video shared service at the BCcampus video shared service meeting scheduled for April 29, 2011 in Vancouver. Paul, I can’t tell you how much I appreciate both the content and the timing of this post. As someone who is beginning to compile a similar piece for my department, you have done a superb job of pulling together all the disparate pieces. I especially appreciate the use case & requirements graphics you have created as this will provide a strong starting point for our own internal discussions around requirements, which begin next week (like i said, perfect timing for your post). Looking forward to April 29th. Glad this is useful and great to hear you’re compiling something on video at RRU. I’m seeing a lot of teaching and learning potential in video. Paul, great post. You have brought together many key examples of how to effectively utilize video to facilitate deep learning with our students. I am very much interested in how a BC solution to the issues around privacy can then help to initiate a positive disruption in the traditional learning model. Thanks for sharing. Privacy is a particularly complex issue and one for which we all define our own boundaries. How open or private do I want to be? Its interesting how trying to solve issues around one thing leads to new positive ways of doing things in another. Paul, thanks for the comprehensive and thought-provoking analysis. Makes me realize I’ve been complacent in thinking webcasting thru our flash media streaming server, posting presentations to youtube and vimeo, and the occasional camtasia screencast were keeping up. I’ll be thinking about new and disruptive uses of video, especially ones that are more conversational and not so instructor or institution driven. It’s been a long road since I first learned to shoot on 3/4″ U-Matic at Mount Royal College in 1980. Time to re-invent myself (again). Thinking about some kind of presentation along these lines for ETUG at Selkirk. Thanks for the kick-start. Appreciate the comments about flash media streaming, vimeo, and camtasia, all further enhancements to the video EDU analysis I’ve done. Great to hear this post is thought provoking and look forward to seeing your presentation at the ETUG Selkirk event. To echo above, Paul, this is even beyond comprehensive, thanks for the summary and some good references. I did notice an omission of iTunesU as a platform (is this another Patriot Act issue? I see a numer of Canadian Unis there (Queens, McMaster, etc). A potential tension for students may be the differences between the places they explore/create videos for their own interests and an internal system, although there are certainly a number of places doing sophisticated work with Kaltura. Thanks for adding iTunesU as a video platform – totally agree. At our first meeting with BC post secondary institutions a number of colleges and universities had gone down that path but not had a particularly positive experience. I too find the issue around where we (and students) pursue our own interests online and and whether institutions should align themselves with that an interesting tension point. Should institutions be in Facebook or not? 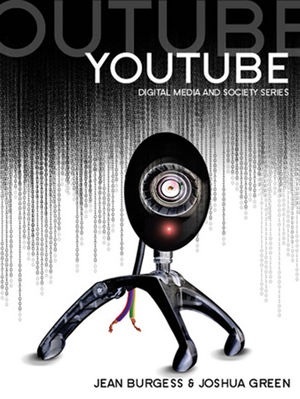 Should institutions simply post to YouTube or create their own system? Do students want education delivered to them in the environments they are using for personal interests – or not? Hmmm, can’t wait till students start speaking up about these things. Hope you have a great road journey. Be great to see you up in BC. I have eliminated ALL written (paper-based) assignments from my many courses and now require all students to make a research-based video and write a blog. The results have been fantastic. The students learn production skills transferable to many situations. They get to do something they find creative. I no longer read boring papers ripped off the Internet. Their work is public, so they can learn from each other. And the blogging allows me to see what they are learning from the lectures and texts. I’m intrigued by your elimination of all written paper-based assignments. Using research based video and blogs as alternatives is a new form of academic expression. I particularly find the idea of having student’s work be public and having them learning from each other as critically important contemporary pedagogical practices. Kudos to you for making this change and for your fantastic book. The book has been highly influential in my thinking. The way you trace the evolution of video from home movies to its current manifestation as You Tube video is great cultural interpretation and social history. I’m participating in a BC edtech conference this June where we are crowdsourcing an opening keynote as short video submissions from presenters and attendees. Student’s work should generally not be public, unless the student chooses to publish, until he/she chooses to reverse that choice. While computer/network/collaborative/e-learning may have a lot of advantages, privacy should be of fundamental concern: no institution should require waiving the right of privacy by demanding students to ‘blog’, and no educator should have room to misinterpret the concept of privacy. This is not an issue of privacy. My courses come with stated, explicit requirements. Students have the option of not taking my course if they fear public exposure of their work. The point of making their work public is to hold them accountable to the public and their peers for its quality and accuracy (particularly important in the lapse of ethics re: rampant plagiarism). The point is to prepare them for a workplace where their work will be subject to interrogation by many. The point is to take their pre-existing practices of self-publishing and apply it to a intentionally productive and public activity. I see no point in pretending that the vast majority of my students engage in private-ness in their online existence or in further isolating them from the public sphere. University should require students to enter the public sphere just as much as it requires professors to do so. Privacy is a social construct, not a innate right. It is ours to mould and refashion. It is an ideology, one that is used against the masses and clearly favours the powerful. Why cling to a value that reinforces state and corporate power?